There was nothing but sunny skies and calm seas along the north Channel today. 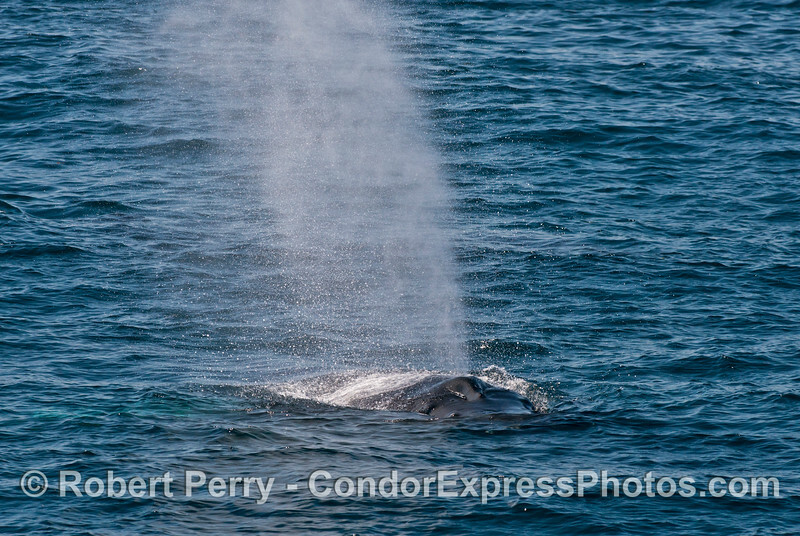 Conditions were ideal for spout spotting and whale enjoyment. 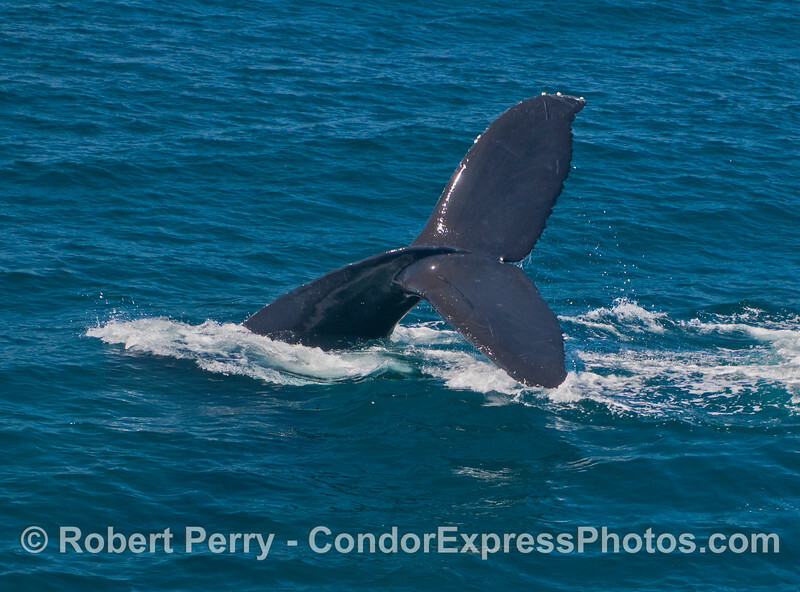 We ran to the northeast Channel not far from yesterday's good sightings. 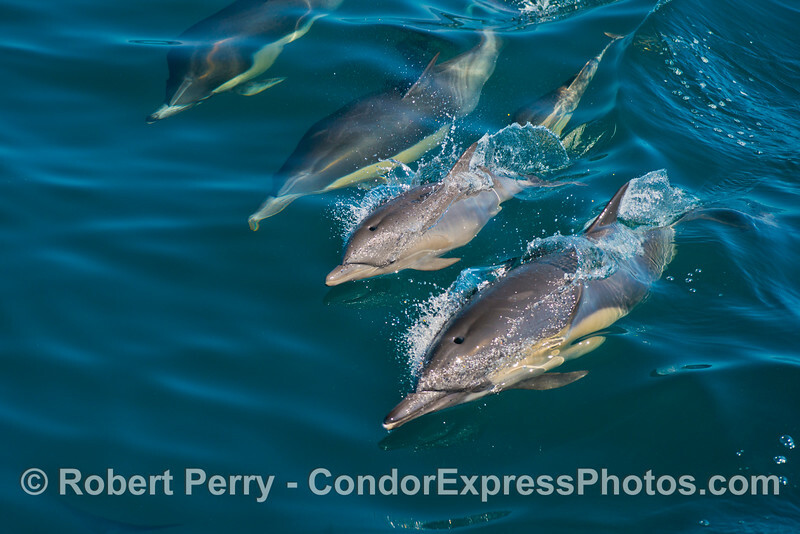 Along the way we had the pleasure of the companionship of at least 800 common dolphins, many many were with small calves. 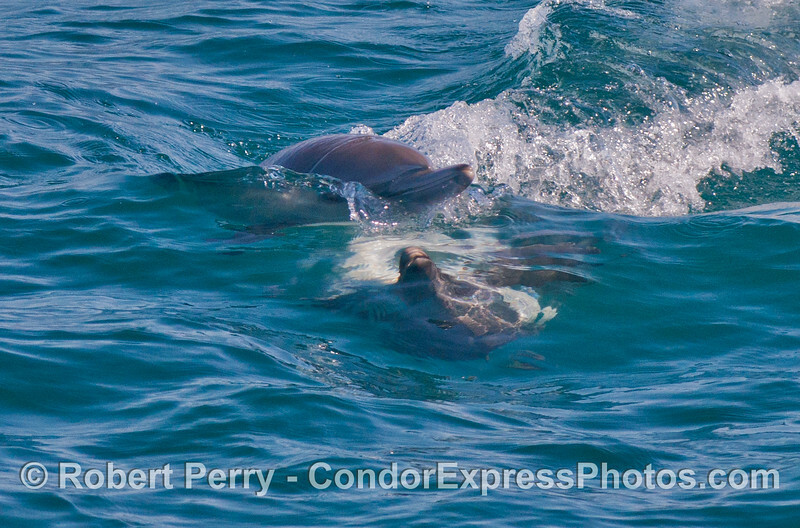 They came alongside, rode the bow and surfed the wake waves thrilling all dolphin lovers on board (that's everyone). 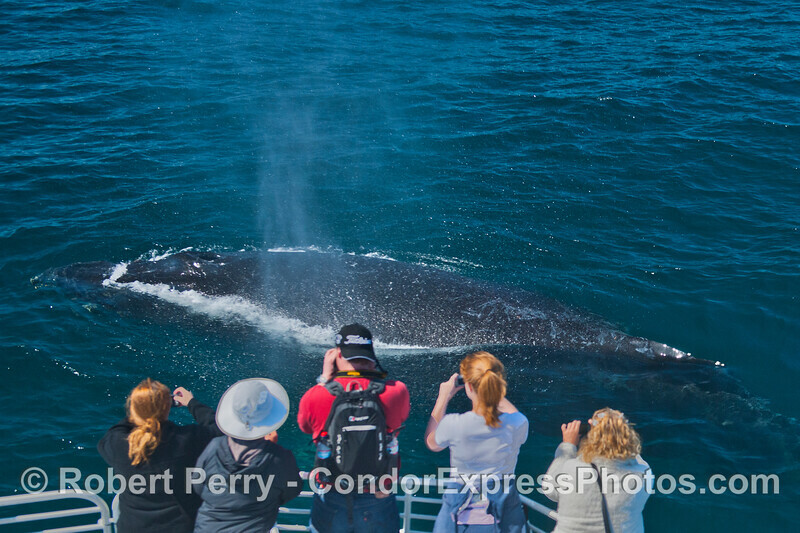 Not long after we left the playful dolphins, two spouts were spotted and when we got close enough to see, it was two humpback whales. One was our buddy "Rope," and she had her pal with her. Is this "pal" a male? 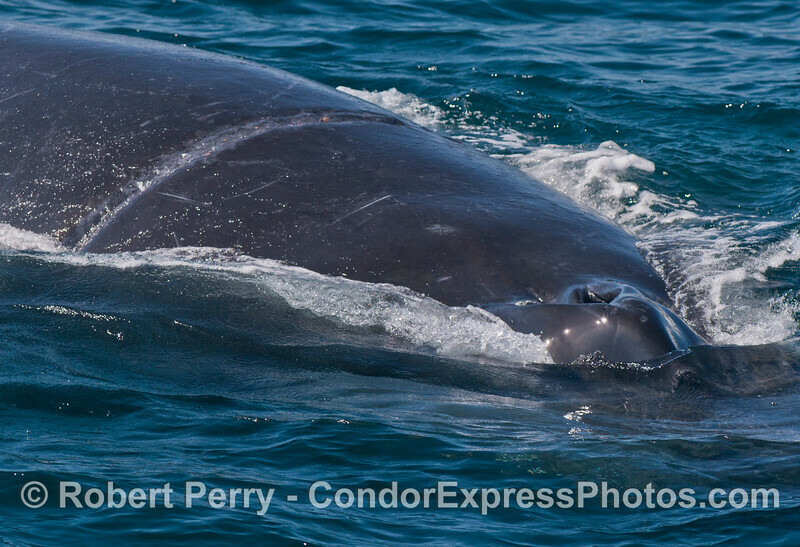 I'm not sure, but through my eyes I could swear I saw a little attraction between them, and Rope's behavior seemed to feed off the other whale's antics. The main show stoppers today, starring Rope and friend, were one long friendly approach session that lasted almost an hour, and later, a shorter encore performance. 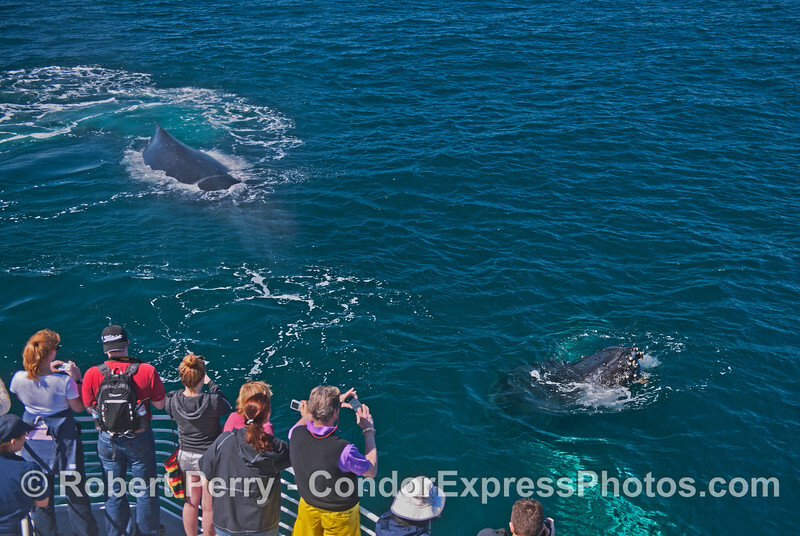 There was lots of spy hopping, rolling around, swimming under the boat, a couple of dramatic tail-throws, and the best was an approach off the bow that was so close you could look right down its blowhole....which lots of people did, not expecting a big blast of spout spray to cover them with whale love. The crew had to clean the windows because the spray covered them with water. 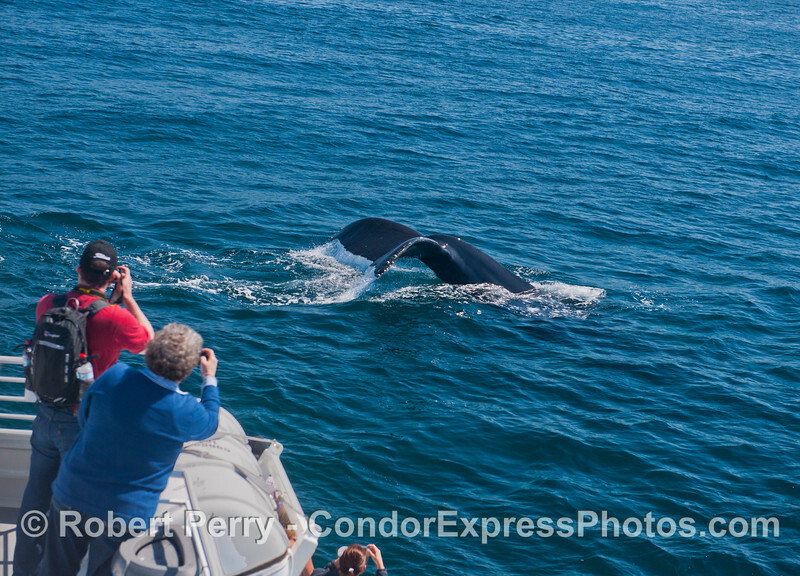 These are the most friendly whales you could ever expect to see. 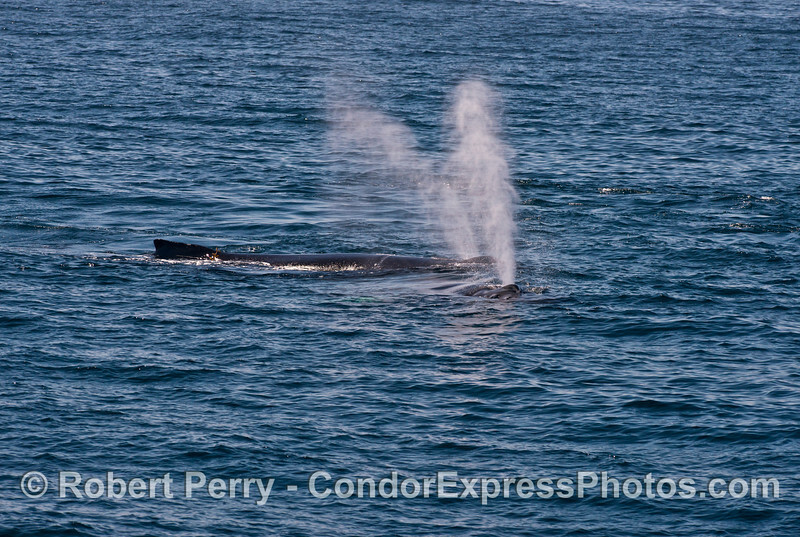 A couple of Minke whales were also seen as the boat passed near spots of bird and dolphin feeding activity. Wow. It was a magical day on the Channel. 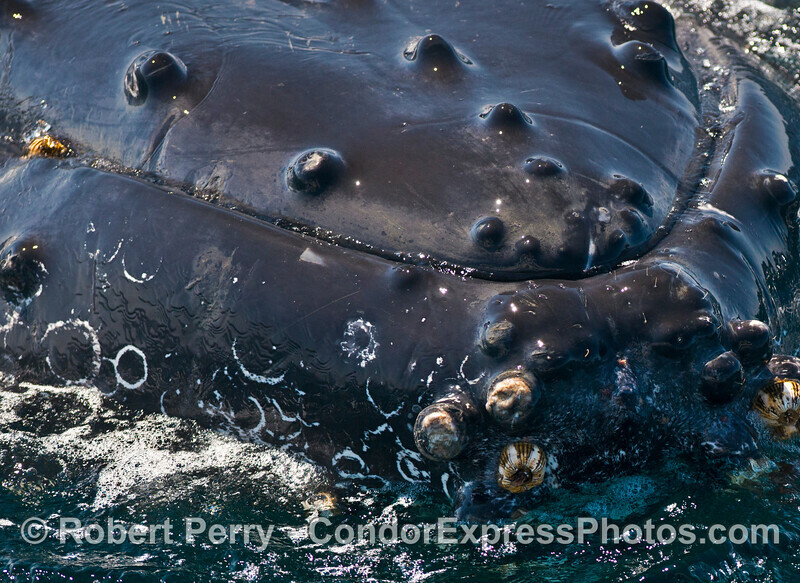 A very close look at the tip of the rostrum with its tiny hairs - a humpback whale (Megaptera novaeanglia). Cameras click as this humpback whale (Megaptera novaeanglia) throws its tail and makes a big splash. 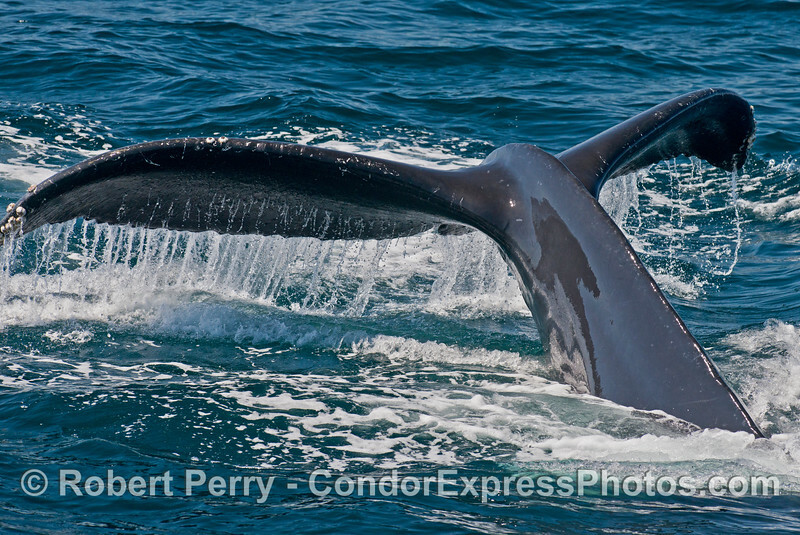 Tail of a humpback whale (Megaptera novaeanglia) with a lazy throwing action. 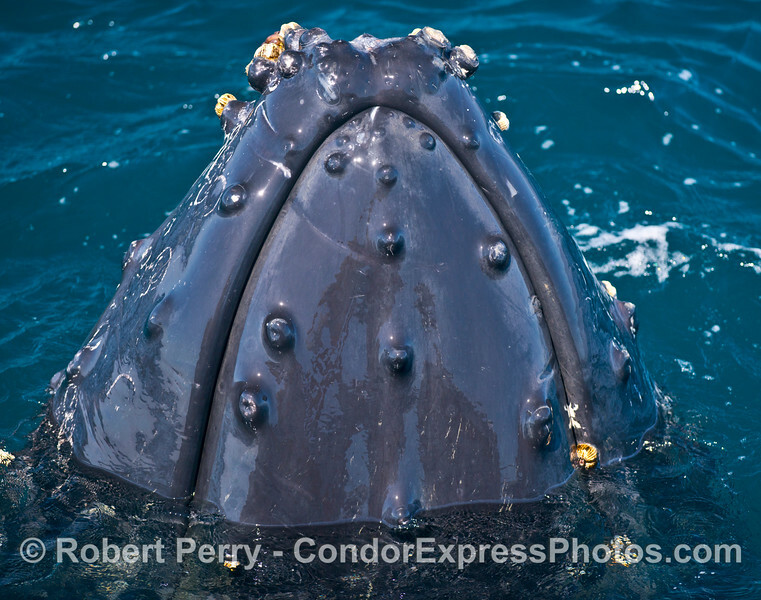 One of several extreme close up images of the tip of the head, or rostrum, of a spy hopping humpback whale (Megaptera novaeanglia). Knobby white barnacles are seen growing on the skin here and there. 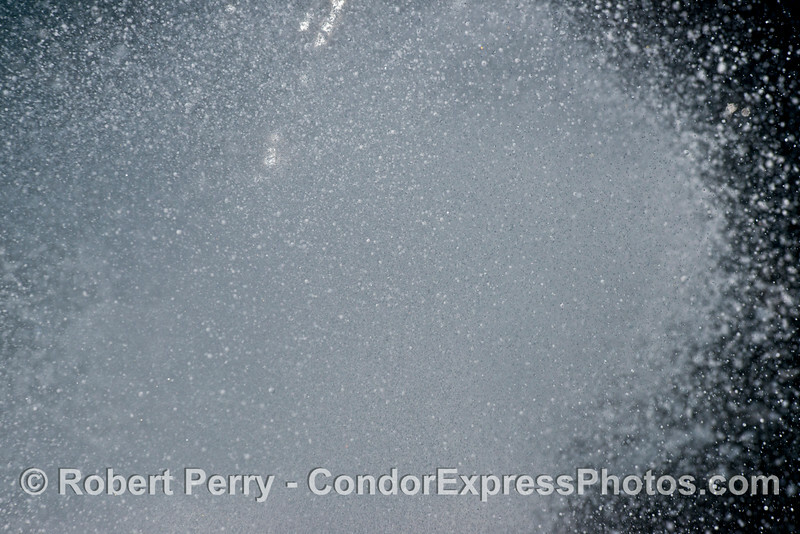 A friendly humpback whale (Megaptera novaeanglia) heads for the camera and tries to wash the lens with spray. Time to duck! A friendly pass by a curious humpback whale (Megaptera novaeanglia). 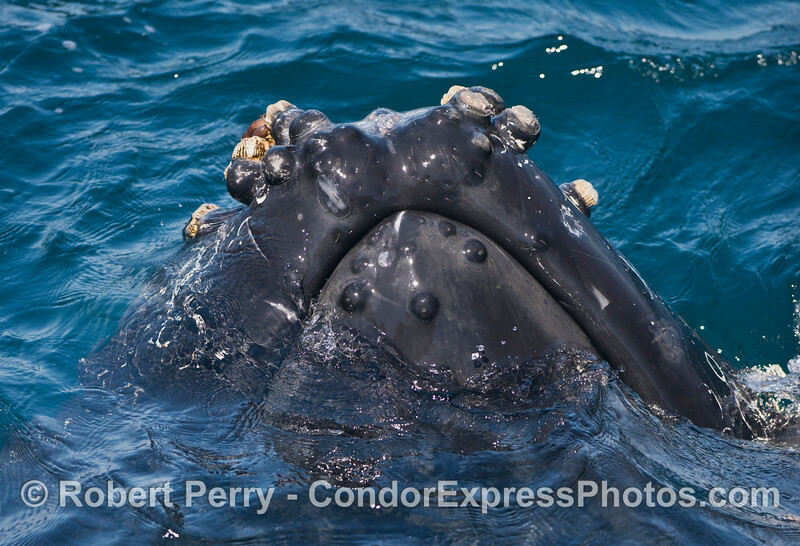 One of several extreme close up images of the tip of the head, or rostrum, of a spy hopping humpback whale (Megaptera novaeanglia). A spy hopping humpback whale (Megaptera novaeanglia) is seen in fairly clear water where the white pectoral flippers can be seen. 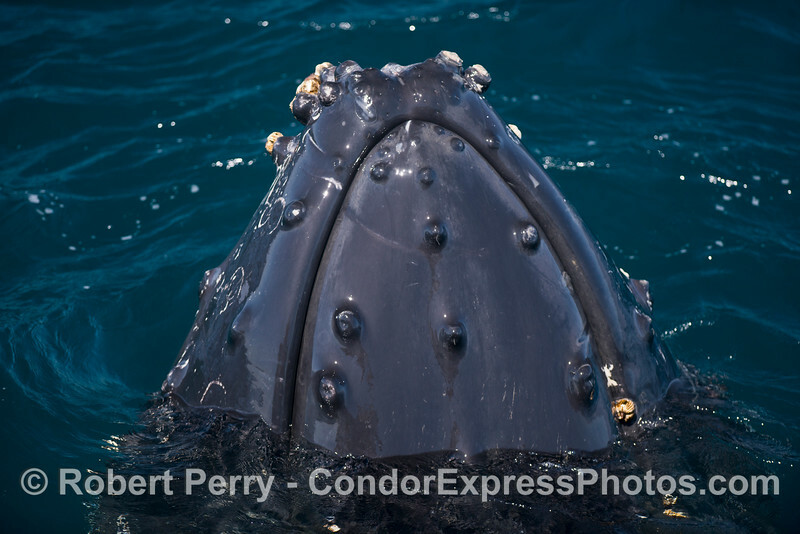 One of several extreme close up images of the tip of the head, or rostrum, of a spy hopping humpback whale (Megaptera novaeanglia). If you look close you can see the hairs on its chin. 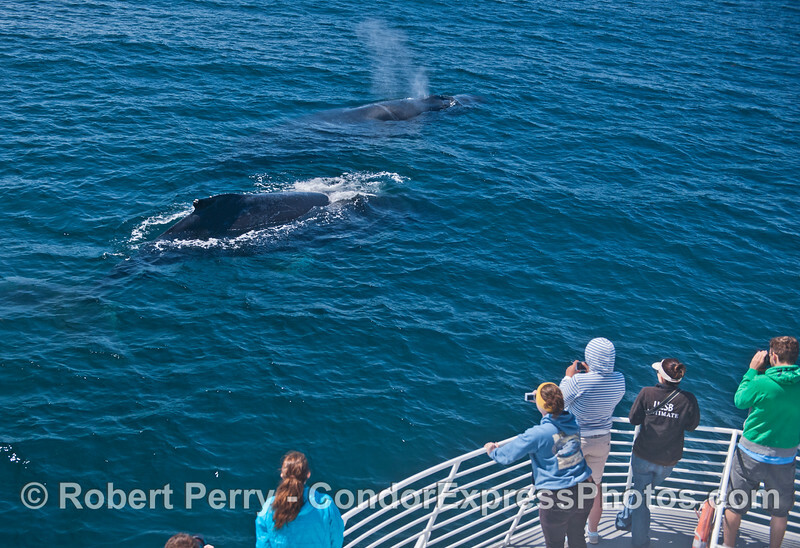 Two humpback whales (Megaptera novaeanglia) come by for a close visit. 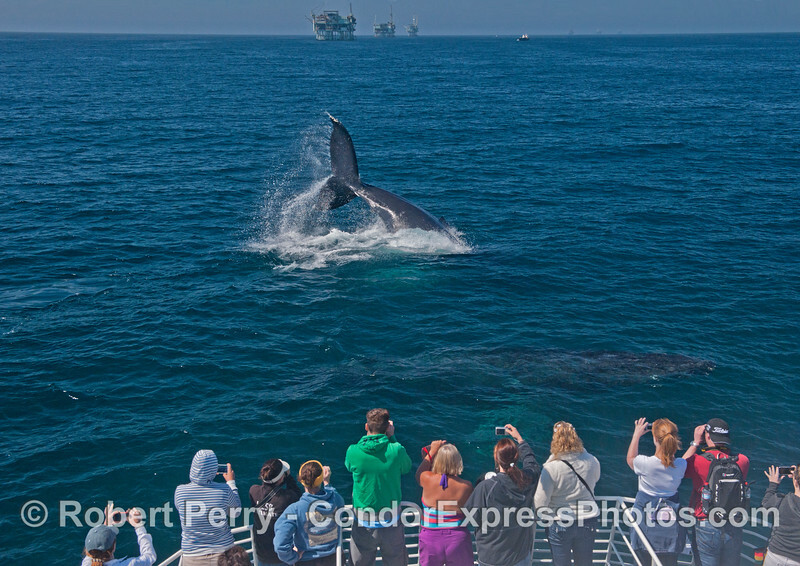 The outer whale is our friend "Rope." 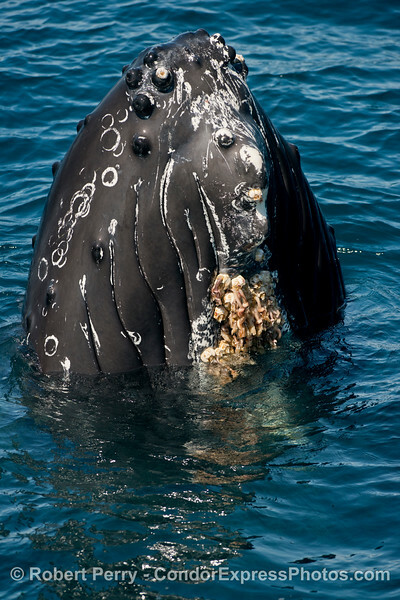 The underside of the head with its barnacles and ventral grooves is shown in this extreme close up images of the tip of the head, or rostrum, of a spy hopping humpback whale (Megaptera novaeanglia). 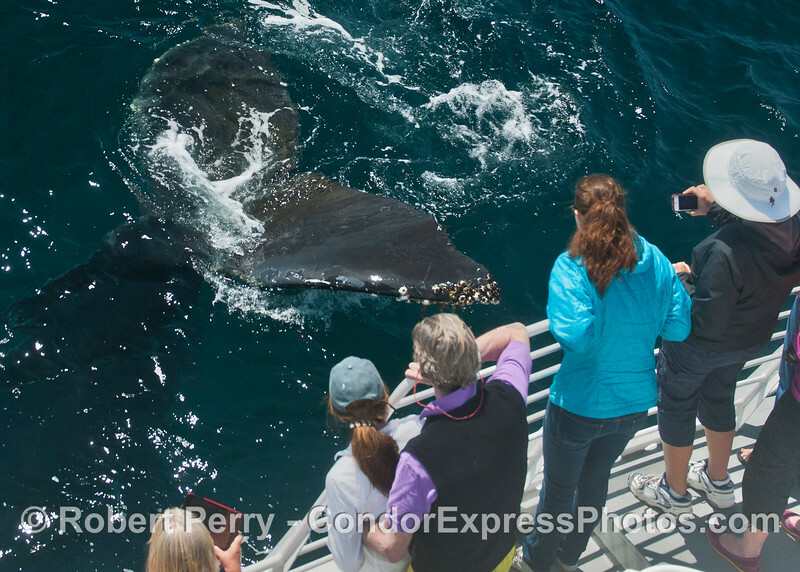 Don't touch the humpback whale tail (Megaptera novaeanglia) ! 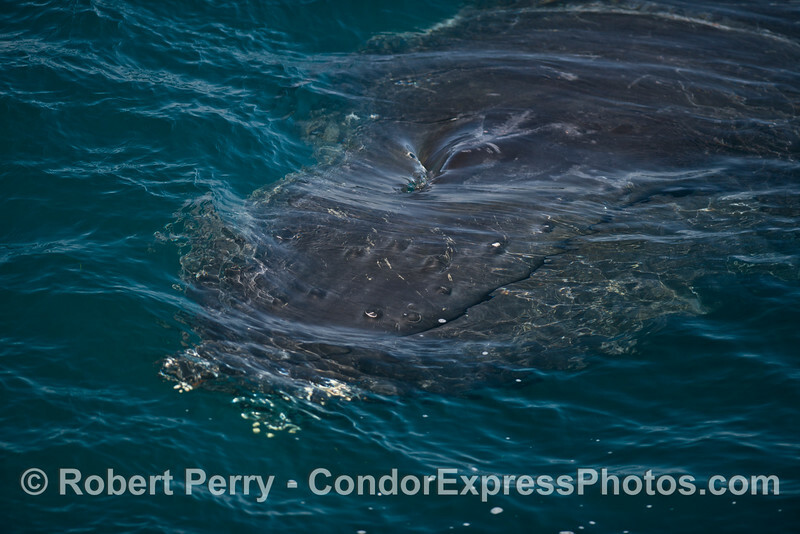 More spy hopping from this humpback whale (Megaptera novaeanglia) with its pectoral fins outstretched below the surface. Cameras, iPhones, iPads and various imaging devices are being put to great use immortalizing this friendly beast. 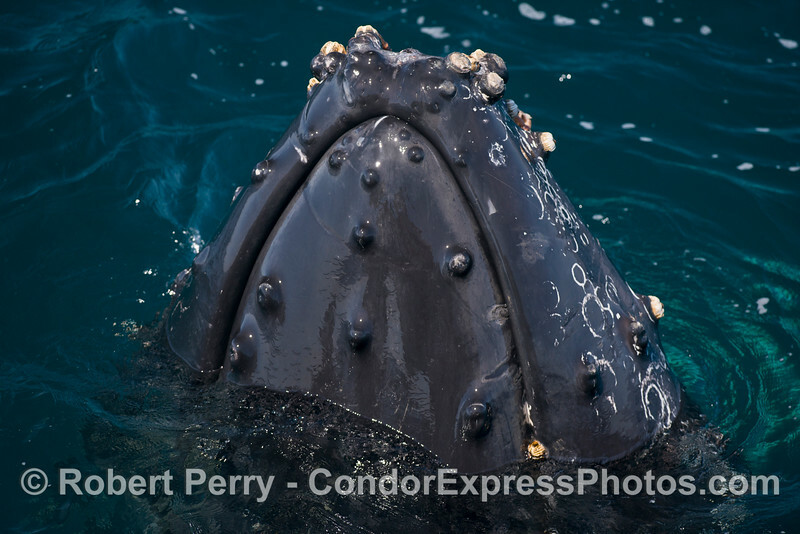 One of several extreme close up images of the tip of the head, or rostrum, of a spy hopping humpback whale (Megaptera novaeanglia). 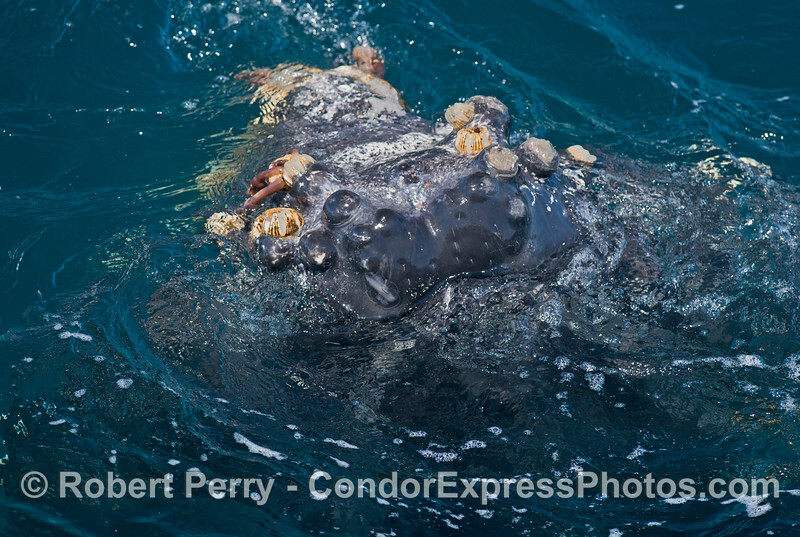 The underside of the chin is festooned with barnacles. 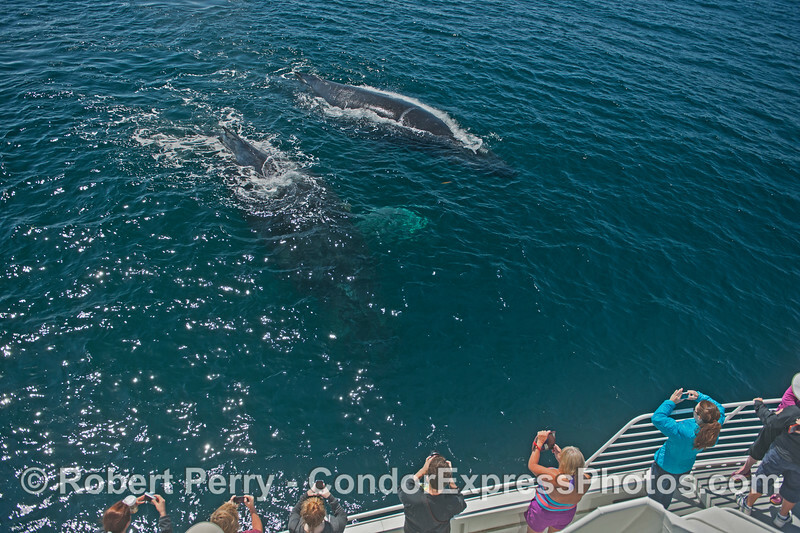 Two humpback whales (Megaptera novaeanglia) approach the Condor Express. 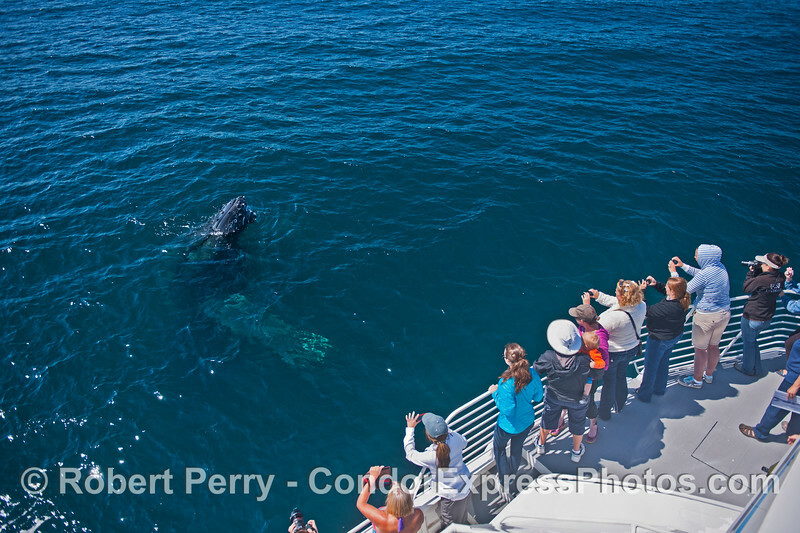 The upper left whale is our friend "Rope." Abstract sea monster? No, it's an extreme close up image of the tip of the head, or rostrum, of a spy hopping humpback whale (Megaptera novaeanglia) that is sinking back into the ocean. If you look close you can see the hairs on its chin. 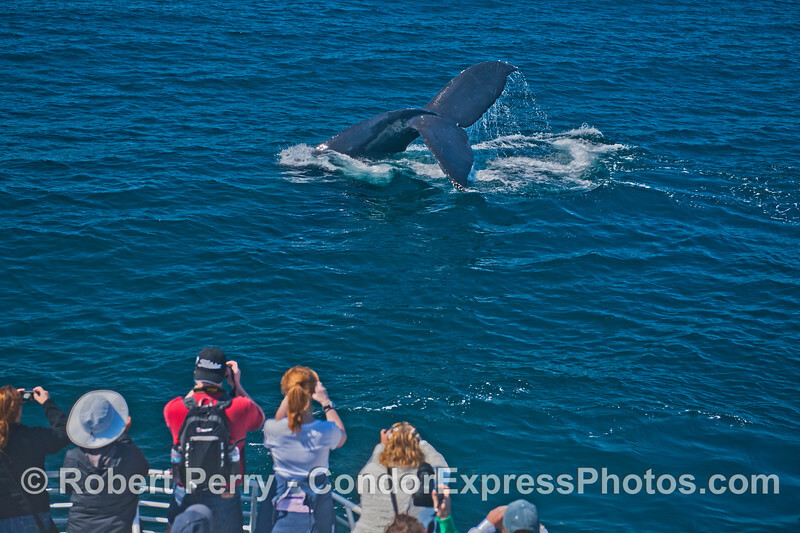 People get a great look at the mighty humpback whale (Megaptera novaeanglia) tail. 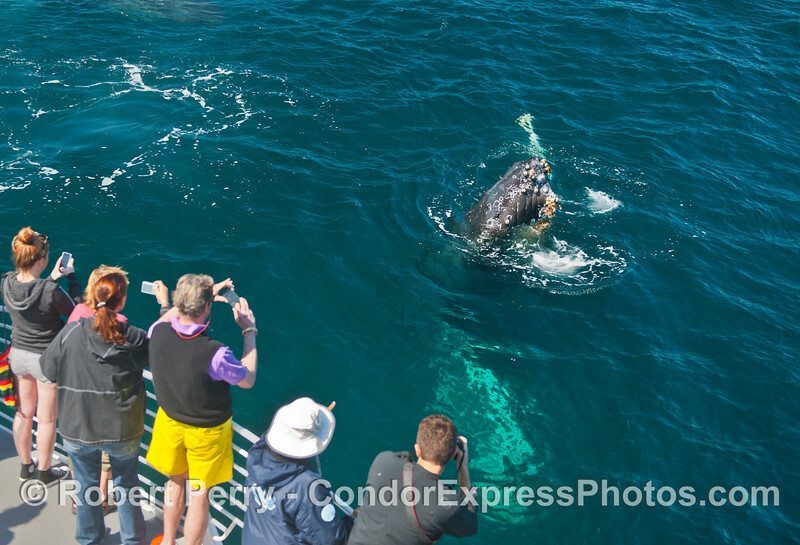 Again the Condor Express is "mugged" by two very friendly humpback whales (Megaptera novaeanglia). 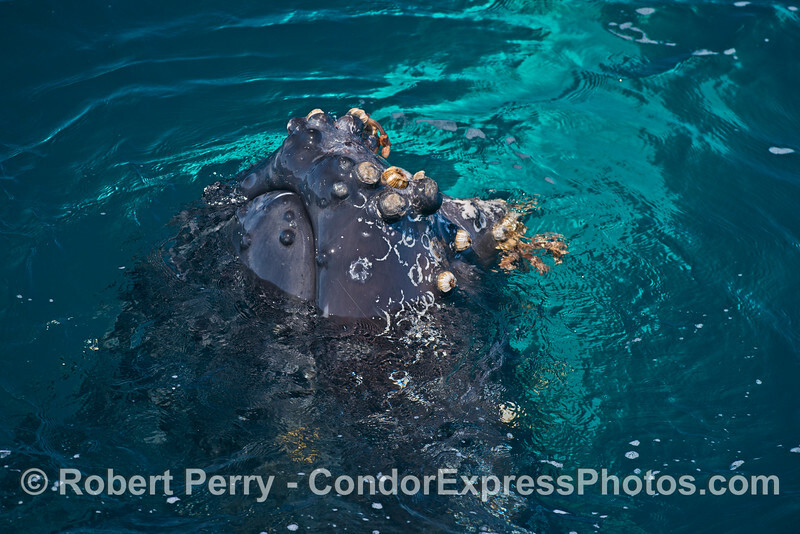 The head of a humpback whale (Megaptera novaeanglia) is captured under the clear water. 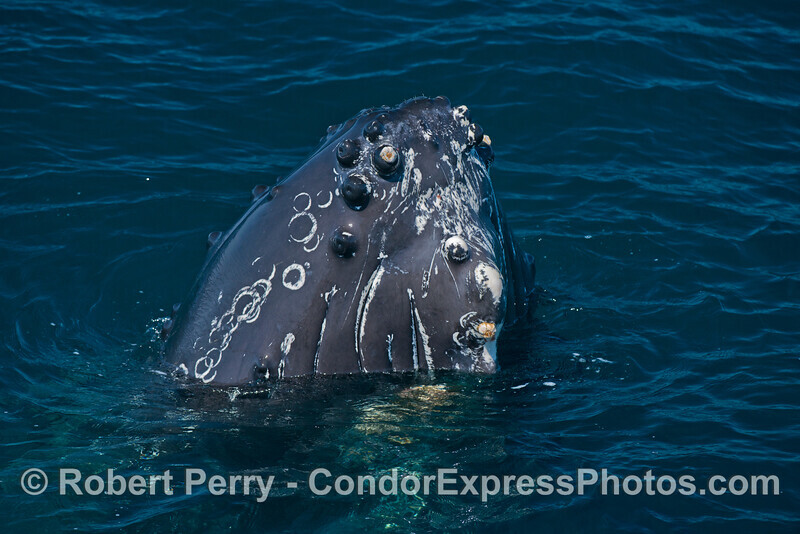 A good look at the distinguishing entanglement scar that identifies this humpback whale (Megaptera novaeanglia) as being the one and only "Rope!" Twin humpback whales (Megaptera novaeanglia), twin spouts. (Rope is in the back). 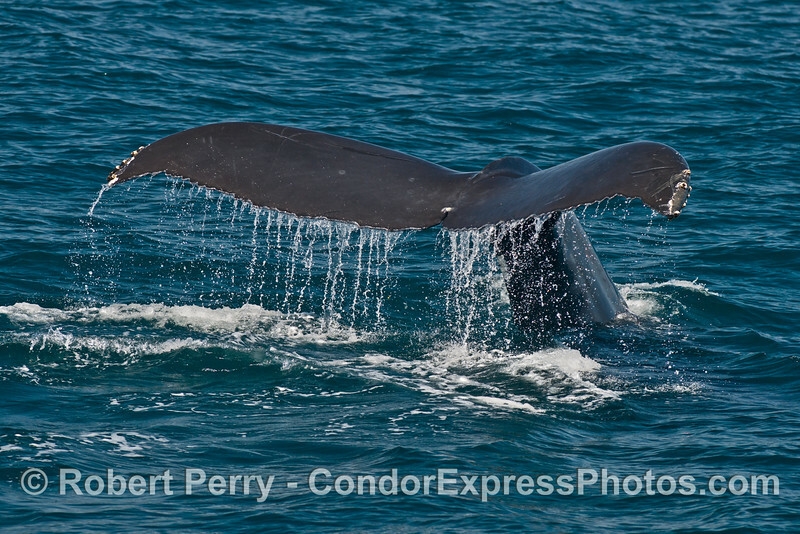 A tall humpback whale (Megaptera novaeanglia) spout. 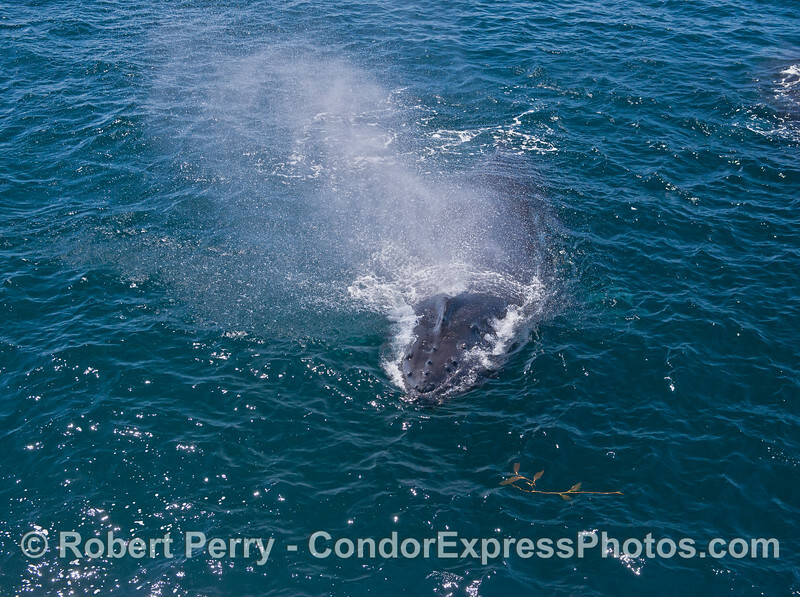 As the humpback whale (Megaptera novaeanglia) passed under the Condor Express, I aimed my lens directly at its blowhole and released the shutter at the exact moment it spouted....then I ducked for cover to keep my camera dry. 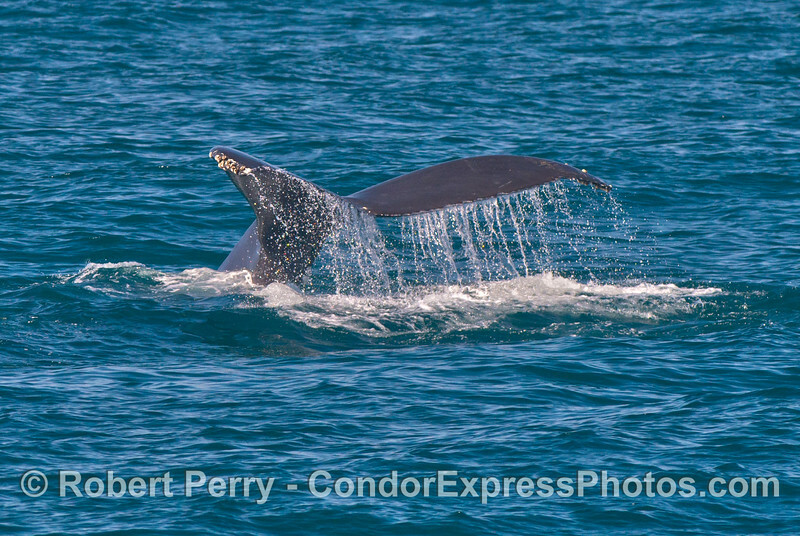 A different look at a humpback whale (Megaptera novaeanglia) tail fluke waterfall. More waterfalls from a humpback whale (Megaptera novaeanglia) tail. A humpback whale (Megaptera novaeanglia) tail fluke waterfall. 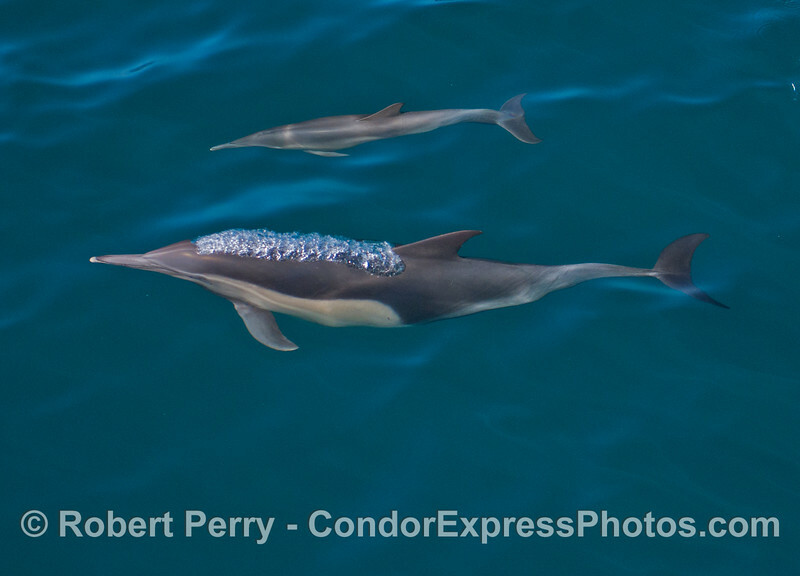 Two more frisky common dolphins (Delphinus capensis). 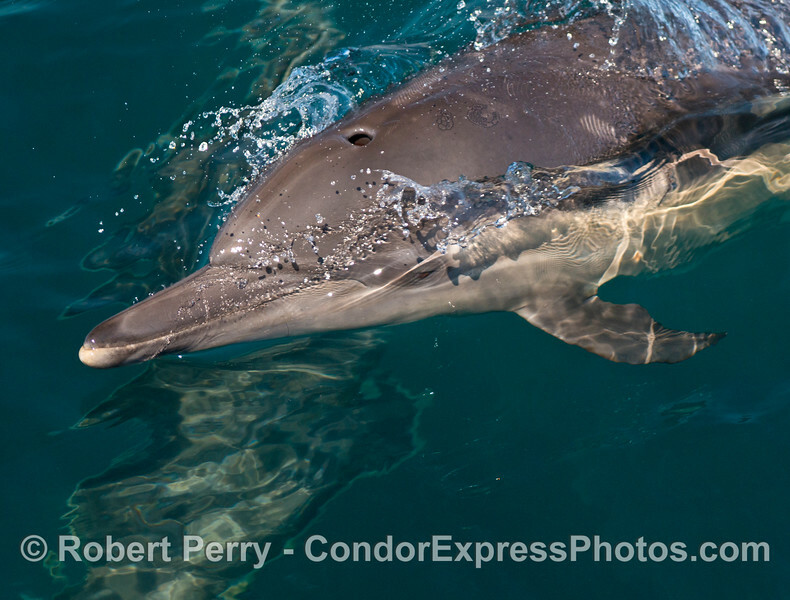 One of several very close up looks at a wild common dolphin (Delphinus capensis). Common dolphins (Delphinus capensis) and mirror glassy water. More glassy water and a speedy common dolphin (Delphinus capensis). 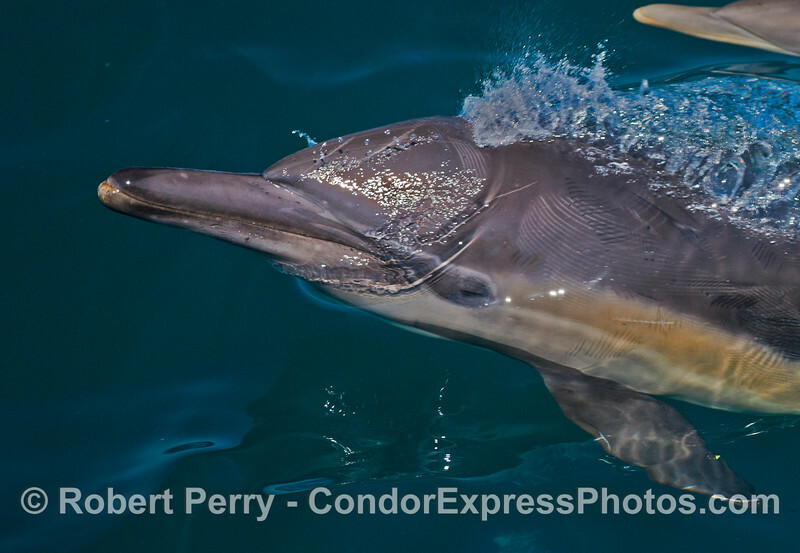 Another close up portrait of a wild common dolphin (Delphinus capensis). 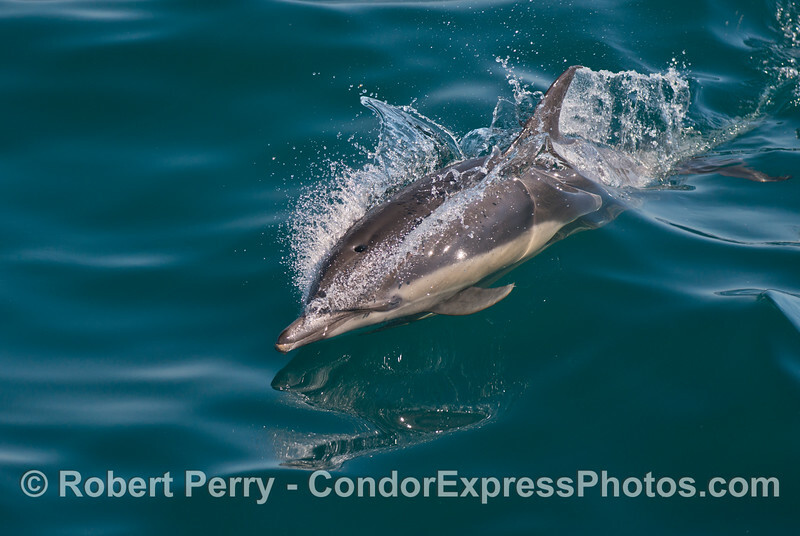 A very small calf swims in very blue water....common dolphin (Delphinus capensis). 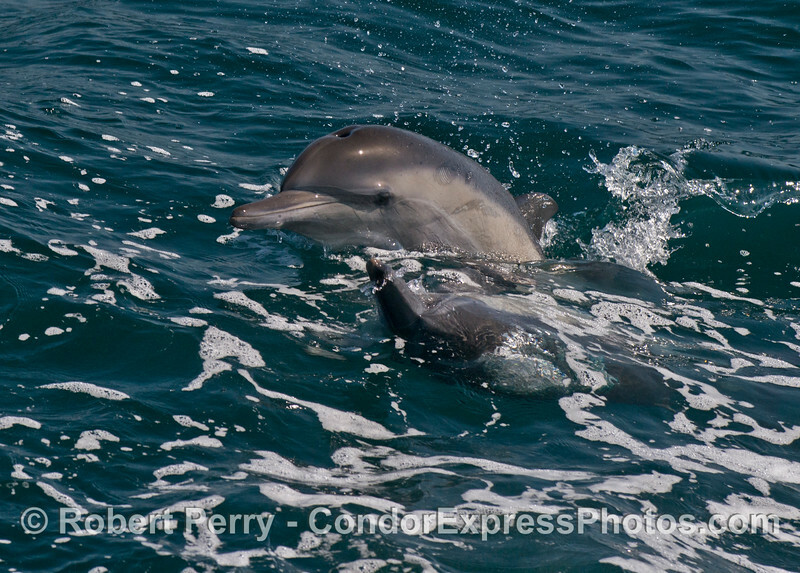 Mother and calf common dolphins (Delphinus capensis). 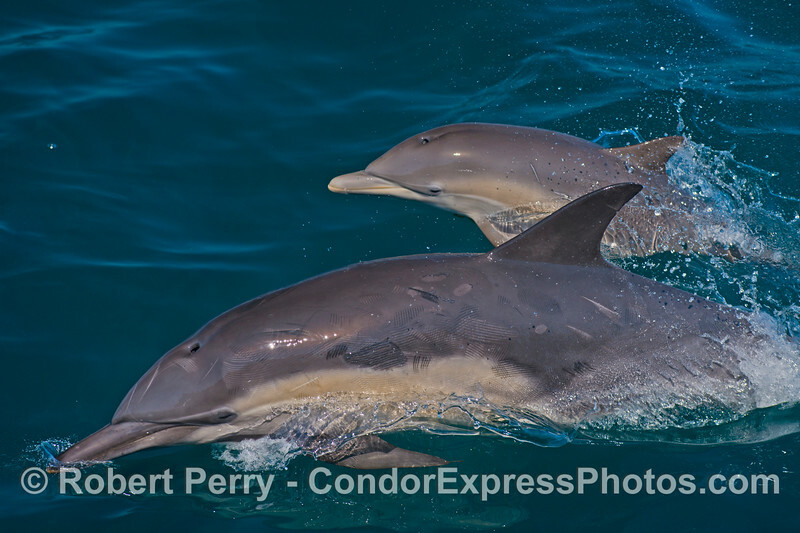 Another view of mother and calf common dolphins (Delphinus capensis). 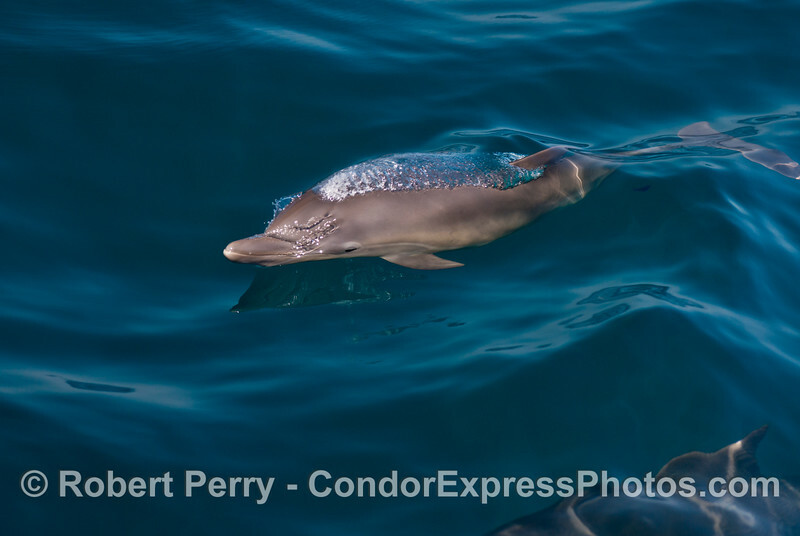 Seen underwater, mother and calf common dolphins (Delphinus capensis). 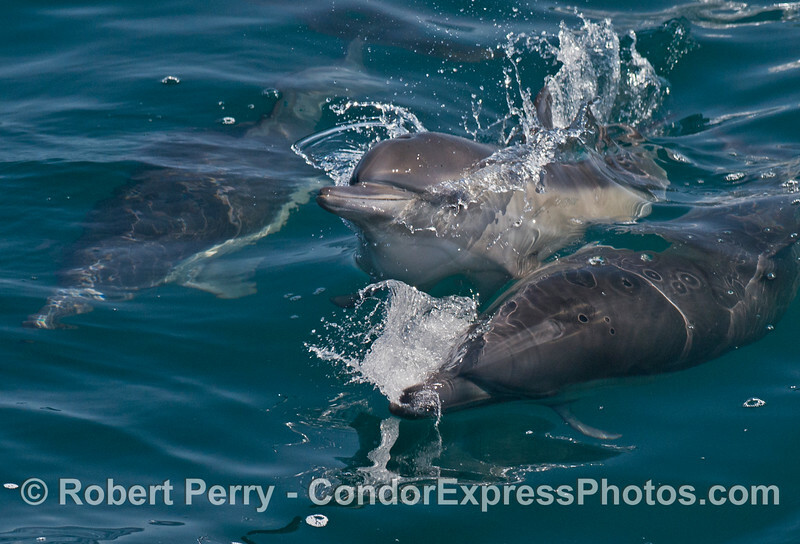 Four common dolphins (Delphinus capensis) ride a small wave with the tiny calf in the middle of the pack. 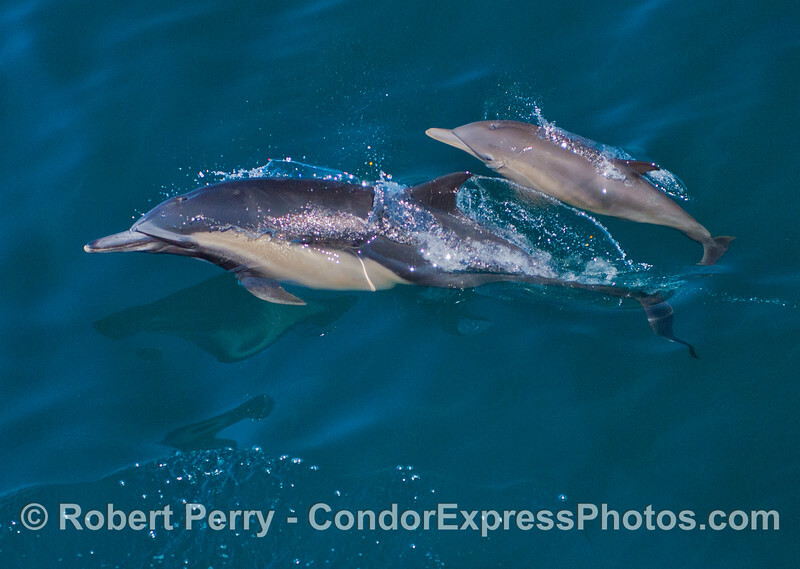 Two common dolphins (Delphinus capensis) are seen cavorting. 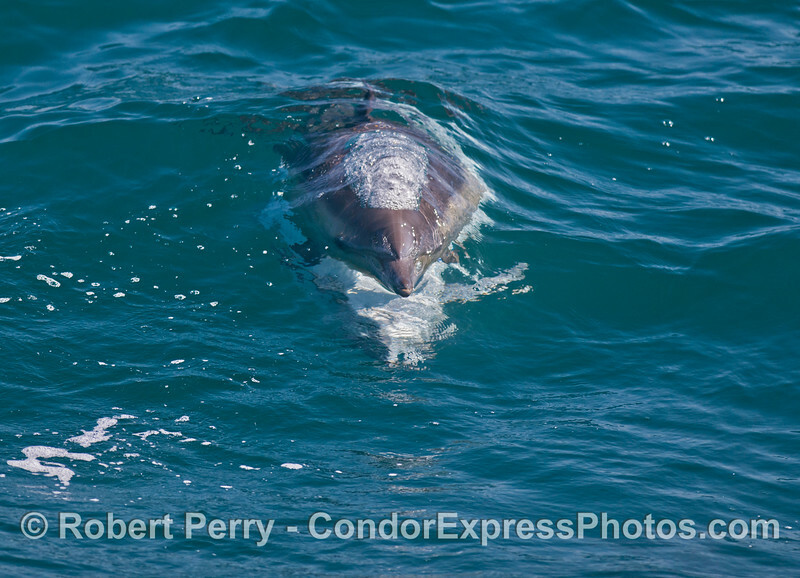 A little common dolphin calf (Delphinus capensis) lifts it head as it swims between two adults. 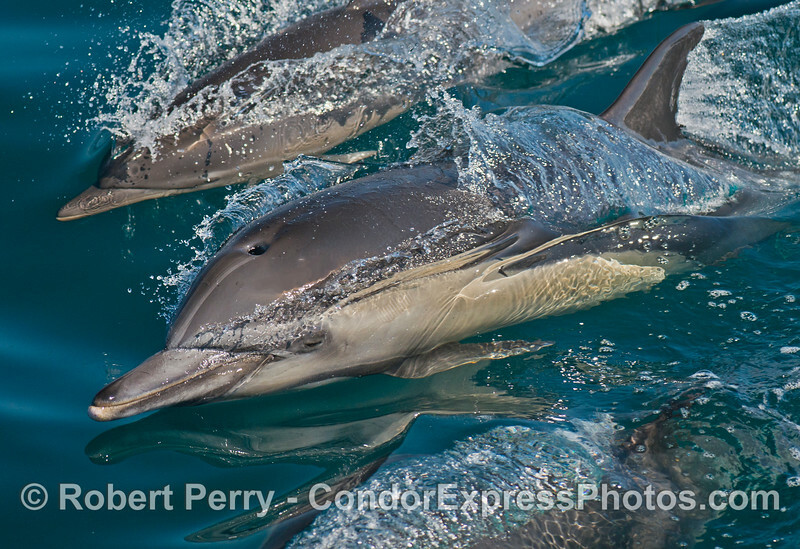 Two mating common dolphins (Delphinus capensis) head directly at the camera. 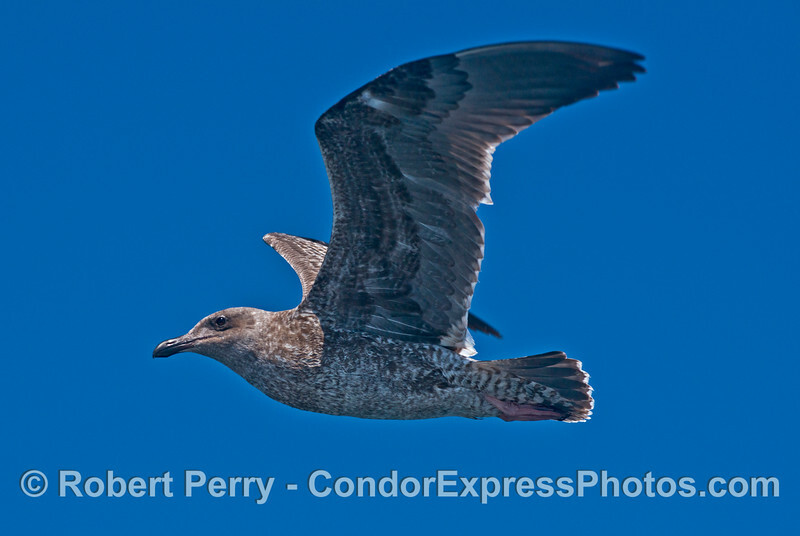 A juvenile gull (Larus sp.) in flight. 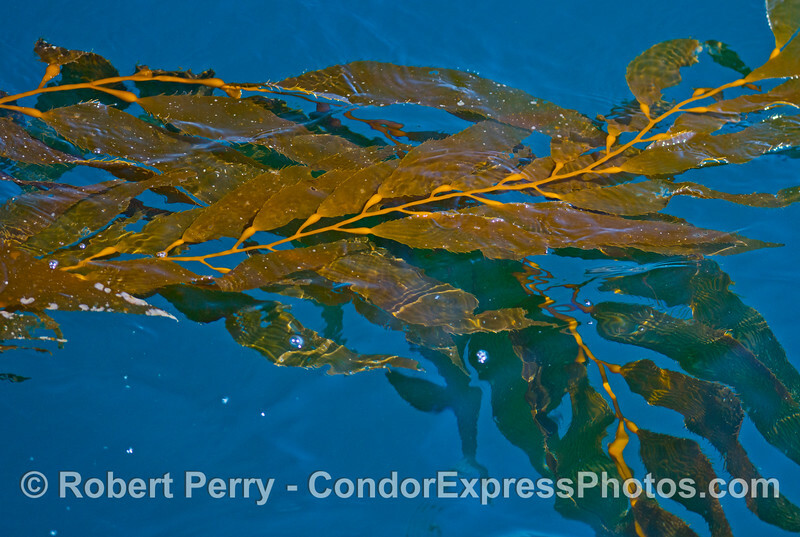 A few stipes of giant kelp (Macrocystis pyrifera) catch a few of the sun's rays while floating on the surface of the clear blue water. 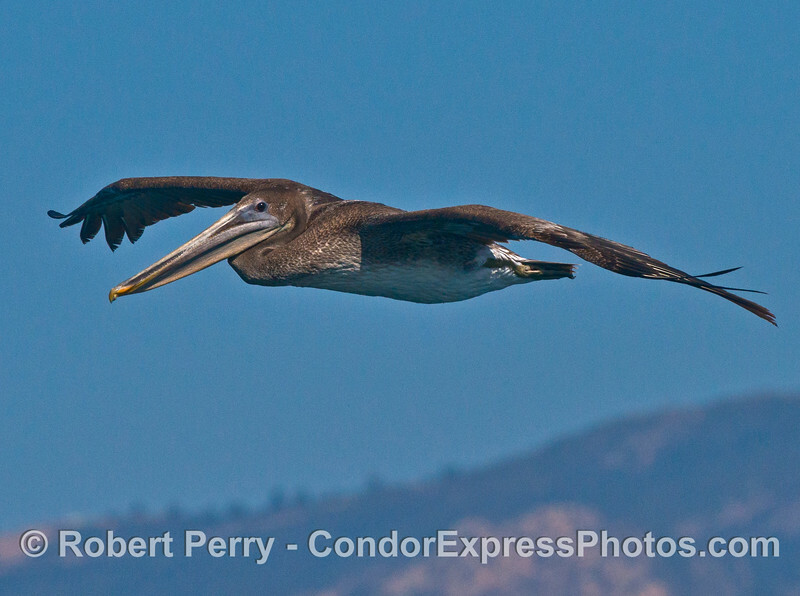 A young brown pelican (Pelecanus occidentalis) keeps an eye on the camera. 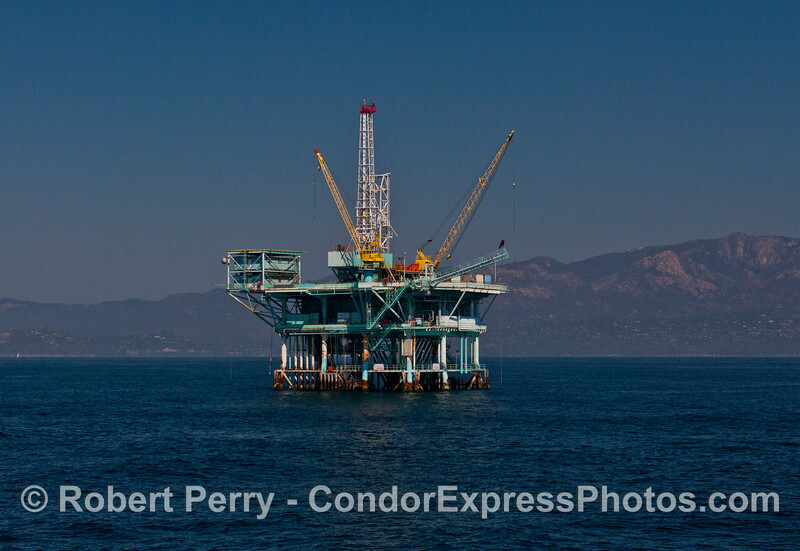 Offshore oil platform "C" off the coast of Summerland.